Request your personal appointment today! 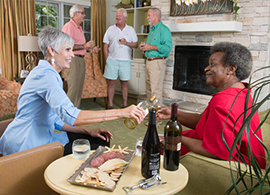 EXPLORE OUR NEW WATERFRONT SENIOR LIVING COMMUNITY! There’s so much that sets beautiful Trinity Landing apart! The list starts with a spectacular location right on the Intracoastal Waterway. It includes first-class, resort-like amenities, wonderful new friends and endless possibilities for socializing, pursuing artistic and cultural pursuits, and more. Best of all, should your needs ever change, you’ll have a plan in place at Trinity Grove, just two miles down the road. Please fill out the form on this page to schedule your personal appointment with one of our friendly Trinity Landing team members. Or feel free to call us at 910-769-9600.